This vehicle is designed for a seamless transfer for small teams, friends, business partners and family members on their special expeditions. The Standard Hire version is a Ford Transit, whereas an Executive Hire involves the exclusive use of a luxury Mercedes vehicle for corporate events and travelling in style. When you avail yourself of the 16-Seater Minibus Hire York package, you enjoy the use of a vehicle in its prime, fully equipped for your comfort, designed with ergonomic efficiency and space-saving capacity in mind, and decked with the latest technology of its time. Our vehicles are no older than 6 years old, but most are fairly new. We welcome any questions you may have about the specific car model you’ll be booking. 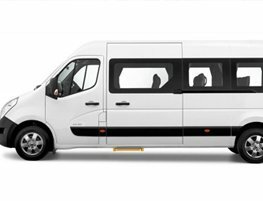 The 16-Seater Minibus Hire York package was designed to accommodate small groups that need a powerful and reliable vehicle to get them from A to B. Our Executive hire clients will also be able to enjoy luxury interiors and state-of-the-art fixtures, perfect for carrying small groups of businesspeople to corporate events. Ensure a timely arrival for you and your friends or business partners with York Minibus. To book your 16-Seater Minibus, double-check our price quote or to speak to a courteous member of the York Minibus team, please don’t hesitate to use the form on the Contact Us page or call us today.